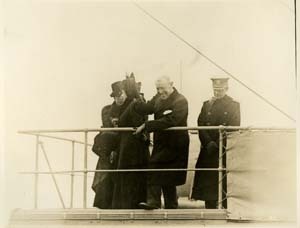 Eleanor Foster Lansing, Edith Bolling Wilson, Woodrow Wilson, and Cary T. Grayson on the bridge of the U.S.S. George Washington en route to England. 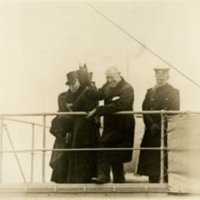 “Eleanor Foster Lansing, Edith Bolling Woodrow Wilson Wilson, and Cary T. Grayson on the Bridge of the USS George Washington,” 1918 December 28, 000000595_0030, University of Virginia Woodrow Wilson Photographs, Woodrow Wilson Presidential Library & Museum, Staunton, Virginia.